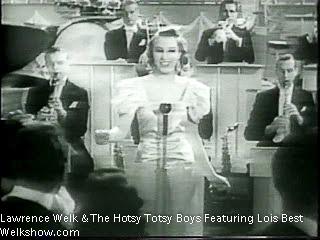 Lois Best was the first to hold the official title of Champagne Lady when she joined Lawrence Welk and the Hotsy Totsy Boys in 1938. She replaced Maxine Gray as the lead female singer in the band. "At times Lawrence Welk's saxophones sound like Wayne King and at other times like Guy Lombardo. On some numbers, there is a Hal Kemp lift to his trumpets but the various musical ideas have been so well blended with accordion and organ that Welk has achieved an entirely new style." --Milwaukee Sentinel, September 4, 1938. Best left the show in 1940 when she married his trumpet player Jules Herman, the man Welk had assigned to chaperone her. Best passed away in October 2015 at the age of 98. Jules Herman grew up in Milnor, North Dakota. Herman studied musical education at Moorhead State College in Minnesota and taught music in Gardner, North Dakota until fellow North Dakotan, Lawrence Welk, asked Herman to join his band. After getting married to Best, they decided not to follow the Welk Orchestra to its new home in California, and instead settled down in the Chicago area and raised a family. When World War II broke out, Herman tried to enlist but was turned down. He spent the war years working at a Chicago area defense plant by day and at night played trumpet for the Griff Williams Society Band at the Empire Room of the Palmer House. He later joined Wayne King, the waltz king, before forming his own band in the late 1940s. In 1952, he and his family moved to the Minneapolis-St. Paul area, and he led the house orchestra at the former Prom Ballroom in St. Paul for 35 years. The eleven-piece group also included Lois Best on the organ. They fronted for stars on their way up who came through St. Paul: Pat Boone, Connie Francis and Bobby Darin. They backed the Four Lads, the Four Preps and the Four Freshmen. Sometimes they played their music first and then made way for stars such as Nancy Wilson and Louis Armstrong. The band also played in 1970 and 1971 for six weeks each at the Roseland Dance City in New York City. Herman also led the Minnesota Vikings football band for eight years, ending in 1982. Herman's band's last engagement was in 1996 at the University of Minnesota. "The check bounced", remembers Lois Best. "That was really funny, to think that was your last night in the business." It turned out to be an innocent mistake on the part of the student committee and Herman ended up getting paid after all. Herman passed away in 2005.